While taking a walk along the grocery stores aisles one thing is clear—snacking is big business. Although many of these snacks are part of an unhealthy lifestyle, eating the right snacks can contribute to better health. For instance, is hummus healthy? You bet. Hummus nutrition is definitely something to keep in mind. What is hummus? It’s a delicious and creamy spread that features chickpeas—also called garbanzo beans. The word hummus actually comes from the Arabic word for chickpeas. The dip has long been popular in North African and Middle Eastern countries. In fact, Egyptians first consumed hummus around the 13th century. Today, hummus is part of healthy lifestyle all around the world. In Israel, hummus is even consumed with every meal. The addition of hummus to your diet is also thought to help decrease the risk of cancer and heart disease. What makes hummus healthy? It contains nothing but the best ingredients loaded with beneficial nutrients. Besides chickpeas, hummus also contains tahini, extra virgin olive oil, garlic, lemon juice, salt, and a variety of other herbs. For example, I like to add freshly chopped parsley to my homemade hummus recipe, which you’ll discover shortly. First, what are the Coles Notes of hummus nutrition? Hummus is regarded as a good protein snack. Not only that, but hummus contains plenty of healthy fats, important fiber, and loads of other key nutrients like zinc, iron, manganese, potassium, magnesium, copper, selenium, calcium, phosphorus, betaine, choline, vitamin A, vitamin C, vitamin E, vitamin K, and B vitamins like folate, B1, B2, B3, B5, and B6. Hummus also includes omega-3 and omega-6 fatty acids. The following is a comprehensive hummus nutrition chart for one cup of homemade hummus. It will help you learn about hummus nutrition facts in further detail. The fiber and other nutrients in hummus definitely make a good addition to any program to manage your weight. It helps people avoid overeating or gain excess weight. The fiber in chickpeas also helps you balance blood sugar levels, and fight cravings. Therefore, it can help reduce the risk of any obesity-related diseases like heart disease, diabetes, and hyperglycemia. The chickpeas in hummus can also help decrease your risk of certain cancers like colorectal cancer. This is due to the ability of chickpeas to keep the digestive system free from toxic build-up and harmful bacteria. Chickpeas also contain cancer-protective compounds like protease inhibitors, phytic acid, and saponins. As mentioned above, hummus is an excellent source of protein. 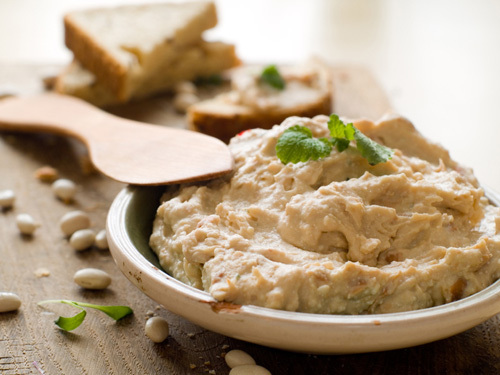 One cup of homemade hummus contains 12 grams of protein, or 24% of your recommended daily intake of protein. The combination of plant protein sources of chickpeas and tahini will certainly make vegetarians and vegans quite happy. The chickpeas in hummus will also help to reduce cholesterol. Legumes like chickpeas are thought to reduce cholesterol levels. In a 2008 study published in the Journal of the Academy of Nutrition and Dietetics researchers found that 45 people between the ages of 30 and 70 reduced their cholesterol levels on a chickpea diet. The olive oil in hummus can also reduce inflammation and help manage high density lipoprotein (HDL) cholesterol levels. The fiber in chickpeas is also thought to benefit the digestive system by promoting regular bowel movements and preventing constipation. It is believed that drained chickpeas contain insoluble fiber that is tolerable for patients with irritable bowel syndrome (IBS) and other digestive troubles. Insoluble fiber will remain undigested until it reaches the colon. Studies have found that bacteria in the colon can metabolize chickpea fiber, which then produces large amounts of short chain fatty acids (SCFAs). The SCFAs will fuel the intestinal wall lining cells. Inflammation is a sign that the body is moving out toxins. Hummus can help reduce inflammatory conditions like arthritis. The olive oil, garlic, and chickpeas in hummus are considered to contain anti-inflammatory properties. In a 2012 study published in the journal Acta Poloniae Pharmaceutica, the anti-inflammatory effects of chickpeas were found to decrease inflammation markers. In a 2013 study published in the British Journal of Nutrition, olive oil was found to reduce inflammation in the body and increase HDL cholesterol. Sesame seeds are the main ingredient in tahini, which is found in hummus. Sesame seeds contain major bone-building minerals like selenium, phosphorus, magnesium, iron, calcium, zinc, and copper. Chickpeas also contain important bone-promoting nutrients such as vitamin K, zinc, magnesium, manganese, and calcium. Zinc is especially important for bone formation and it can help prevent osteoporosis in older adults at risk of bone-related conditions. Olive oil is a key ingredient in hummus that helps prevent cardiovascular disease. In a 2004 study published in the American Journal of Clinical Nutrition, researchers found that an olive oil-rich Mediterranean diet can benefit arterial blood pressure. Olive oil can also improve glucose metabolism and decrease low density lipoprotein (LDL) cholesterol. Studies have also associated a lower heart disease risk due to the high antioxidant properties found in chickpeas. Eating hummus can help boost your energy. The chickpeas in hummus are considered a complex carbohydrate, which the body uses as an energy source. Complex carbs are known to take a longer time period to breakdown after consumption. In other words, the complex carbs offer time-released energy that won’t increase blood sugar levels. Symptoms of high blood sugar or hyperglycemia include fatigue, weakness, and tiredness. Beans, olive oil, and seeds are a big part of a very healthy Mediterranean diet. Several studies indicate that the Mediterranean diet has protective effects against diabetes, Alzheimer’s disease, Parkinson’s disease, cancer, obesity, muscle weakness, heart disease, stroke, and high blood pressure. As a result, you can be sure that hummus can help you live a long and healthy life. Although it is easy to find hummus at the store with limited ingredients, it is more satisfying to make your hummus from scratch whenever you can. That way you know exactly what is in the hummus. This ensures that you can take advantage of all the hummus health benefits. Hummus doesn’t take that long to make either. All you need is a few ingredients and a blender or food processor. The following are a couple of easy-to-make hummus recipes that will last for about a week in the refrigerator. Let’s get started with this basic hummus recipe. Drain canned chickpeas. If cooking dry chickpeas soak them for about an hour, then place them in a large pot and cover with water. Bring it to a boil, and let them boil for five minutes. Remove them from the heat, and let them soak for one hour in the hot water. Then drain the water and rinse the chickpeas before cooking. To cook the chickpeas, put them in a large pot, and use about one quart of water per 1 cup of soaked chickpeas. Bring to a boil, reduce to a simmer, and let them cook until tender for about 60 to 90 minutes. When they are cooked, drain them, and they are ready to use for the hummus. For the hummus, place all the ingredients in the blender, and blend until smooth. Add more olive oil or water to reach your desired consistency. Some people have problems digesting all legumes, including chickpeas. As an alternative, try to replace the chickpeas with two cups of peeled and chopped zucchini and half of an avocado. Also, add another tablespoon of olive oil for flavor. This zucchini hummus will store in the refrigerator for four days. Besides these hummus recipes, there are also other ingredients you can use instead of chickpeas such as sweet potatoes, black beans, red roasted pepper, curry, jalapeno, or cilantro. Eggplant also makes for a delicious baba ghanoush. How do you enjoy hummus on a daily basis? I like to enjoy my homemade hummus recipe with fresh vegetables. I will also sometimes make gluten-free almond-based crackers. You can also often find gluten-free crackers with minimal ingredients at your local grocery or health food store. “Hummus, home prepared,” SELFNutritionData web site; http://nutritiondata.self.com/facts/legumes-and-legume-products/4403/2, last accessed January 19, 2016. Telpner, M., The UnDiet Cookbook (China: Random House LLC, 2015), 97. Pittaway, J.K., et al., “Chickpeas May Influence Fatty Acid and Fiber Intake in an Ad Libitum Diet, Leading to Small Improvements in Serum Lipid Profile and Glycemic Control,” Journal of the Academy of Nutrition and Dietetics, 108(6), 1009-1013, doi: 10.1016/j.jada.2008.03.009. Zia-ul-Haq, M., et al., “Platelet aggregation and anti-inflammatory effects of garden pea, Desi chickpea and Kabuli chickpea,” Acta Poloniae Pharmaceutica, 2012; 69(4): 707-711. Loued, S., et al., “Extra-virgin olive oil consumption reduces the age-related decrease in HDL and paraoxonase 1 anti-inflammatory activities,” British Journal of Nutrition, 2013; 110(7): 1272-1284, doi: 10.1017/S0007114513000482, Epub, March 19, 2013. What Is Hummus? 8 Reasons to Eat It Every Day!” Dr. Axe web site; http://draxe.com/what-is-hummus/, last accessed January 19, 2016.